Commencement: It shall come into force on the first day of July, 1882. Extent: It extends in the first instance to the whole of India except the territories which, immediately before the lst November, 1956, were comprised in Part B States or in the States of Bombay, Punjab and Delhi. 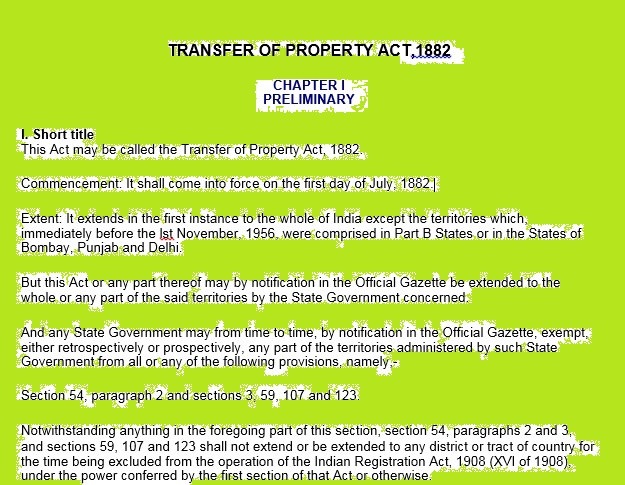 Notwithstanding anything in the foregoing part of this section, section 54, paragraphs 2 and 3, and sections 59, 107 and 123 shall not extend or be extended to any district or tract of country for the time being excluded from the operation of the Indian Registration Act, 1908 (XVI of 1908), under the power conferred by the first section of that Act or otherwise. 2. Repeal of Acts-Saving of certain enactments, incidents, rights, liabilities, etc. (d) save as provided by section 57 and Chapter IV of this Act, any transfer by operation of law or by, or in execution of, a decree or order of a court of competent jurisdiction, and nothing in the second Chapter of this Act shall be deemed to affect any rule of Mohammedan law. Explanation II : Any person acquiring any immovable property or any share or interest in any such property shall be deemed to have notice of the title, if any, of any person who is for the time being in actual possession thereof.